A neighbour of mine told me yesterday that, a few doors down, an elderly neighbour is dying. He wanted to share with me that he was about to go round to the dying man’s house to pay his respects. It was only a matter of days or even hours. I thought about his loving wife caring for him in his final hours. I pondered how he played his part in our community. And it made me think about how I’d like to be remembered when I’m gone. It’s a close neighbourhood for being so central in our city. In fact, it’s quite unusual because we’ve had an annual street party in our cul-de-sac for the past 25 years. We’ve got to know each other pretty well over the years. The party helps better understanding and communication between people who would otherwise be practically strangers. Our elderly “original inhabitants” (our residential estate was built in 1959) look forward to the barbecue, beer and company all year long. The next one is in a couple of weeks and sadly, this one neighbour will not be attending anymore. I was upset by the news that our neighbour was dying. I instantly had an image of him in my mind. One of a tall, slim man with white-grey hair. A retired pastor, so I’ve heard. He was always accompanied by his friendly and rather shy-looking wife. Either on their bikes or on foot. They seemed to do everything together and still appeared content after decades of marriage. And whenever he saw me or my kids, his face lit up with a friendly smile. He mostly followed with an affable question about our health or a comment about the weather. We rarely stopped to talk to each other for long but these short exchanges of pleasantries will always stay in my mind as little highlights in our neighbourhood. How will I remember him when he’s gone? The tall, slim, gentle and grey-haired guy with the smiley face who always had time for a friendly word or two. And so I started thinking about what people would say about me when I’m no longer here in this world. I suppose, without realising it, I’ve been subconsciously working on that for the past 20 years. Since I had a heavy bout of depression. That’s when I really started getting to know myself and, at first, not liking a whole lot of what I saw. I was often moany and felt sorry for myself. Feeling like the world was against me. Muddling along and secretly hoping that someone would come and rescue me. Do all the hard work. Sort me out with a magic wand. Twenty years ago I was rock-bottom. But when I realised this, it gave me the clarity and strength to look for help. Start changing things in my life, baby step by baby step. I took on new, healthier habits. I started looking after myself better, both on the inside and outside. Slowly becoming who I truly wanted to be. And nowadays, I’m happy to say that I like myself a lot and know myself much better. And the journey will continue for the rest of my life. More than twenty years ago I started working as a coach. I love helping people to learn and grow. Move forwards with their work and lives in a positive way. “Onwards and upwards” is one of my mottos, after all! 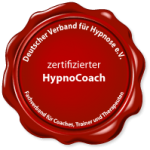 And hypnosis coaching is no exception. My goal is to help thousands of people realise that they have the power within themselves to make any change in their lives that they want. I want to empower people to reactivate their inner wisdom and innate confidence. So, I hope that my clients will remember me as a positive, enthusiastic and friendly person. Someone who always had their best interests and their growth at heart. A woman who made them feel special. And how will my friends and neighbours remember me? Well, I hope as a friendly person who lent a hand or an ear with or without being asked. A person who chose her own path and relentlessly worked on achieving her goals. A lady who had her own definition of success. A woman who loved and supported her family without sacrificing her own dreams and wishes. So, are you happy with your life’s path? Your choices and decisions in life up until now? Do you have any goals or are you muddling along? 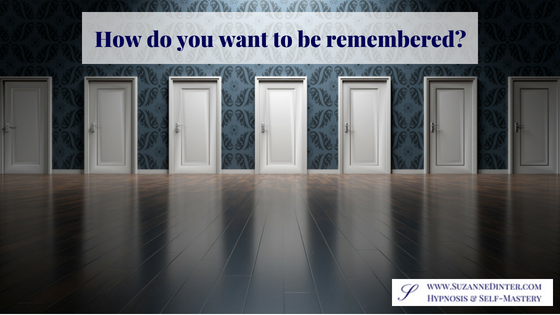 How do you think you’ll be remembered? Close your eyes and take a minute to think about it. Does it need tweaking or rewriting perhaps? If it needs a bit of re-working, why not make some incremental changes starting now? It’s never too late and change can happen quickly! Think about what you really want and how you want to be. How you’d like to live your life (not how the others want you to live it). And DECIDE to be happy/more confident/go for that promotion/see the world. You’d be amazed how setting yourself some goals (however big or small) and deciding to make them happen (taking incremental steps) will make a huge difference in your life, too. If you would like some professional assistance in making positive changes, why not let me help you to unleash your power? Assist in finding the right path for you. Encourage you to make (mentally and physically) healthy choices. Awaken your innate confidence and inner wisdom. So now, how do YOU want to be remembered when you’re gone? Let me know in the comments below! Please book a free, initial consultation call here. Find out how we can work together here. A thought provoking post. Something I’ll be thinking about over the next few days. Thank you. Thank you for commenting, Claudia. Glad it resonated.